Now Organic! 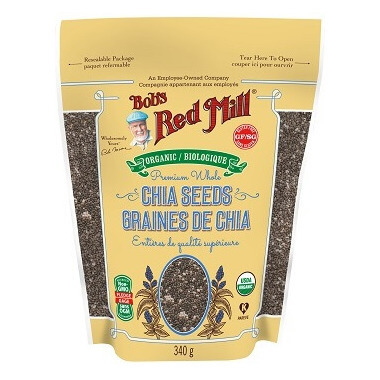 Chia Seed is known for its anti-oxidant properties, omega-3 content, and amount of fiber. Thousands of years ago, chia seed was a staple in the diets of ancient Mayans and Aztecs. The word chia is derived from the Mayan language, meaning "strength," and Aztec warriors relied on chia seeds to boost energy and increase stamina. Today this tiny seed is a favorite of athletes, especially distance runners, who tout it as an endurance enhancing superfood. Chia seeds contain a wealth of fiber; 5 grams in just one tablespoon. It is the fiber in chia that causes chia seeds to swell when combined with water, creating chia gel. Whether you eat chia gel or just the raw seeds, the hydrophilic action of chia seeds will keep you full longer than many other seeds. Amazingly, chia gel can also be used as a substitute for eggs in many baked goods. Use a proportion of 1 to 6 ratio of Chia Seeds to Water to make chia gel. Use approximately one tablespoon of chia gel to replace one large egg in your baked goods.